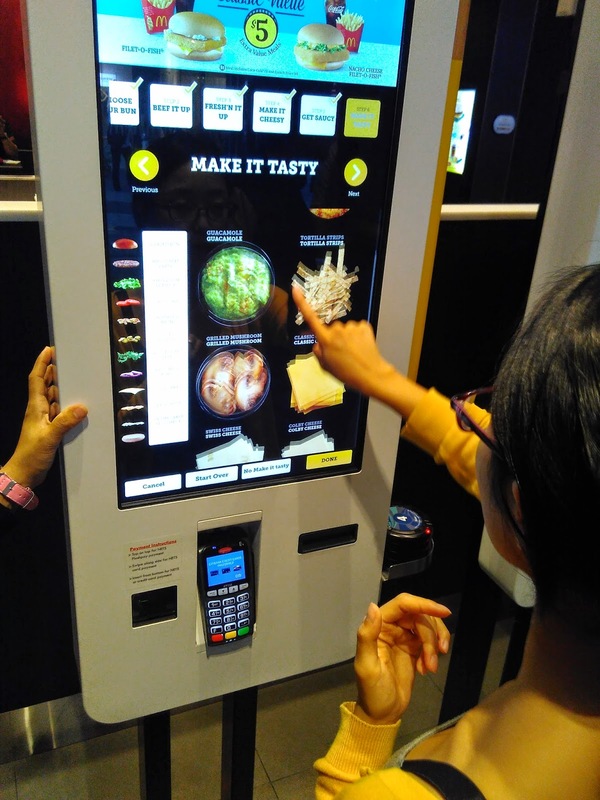 Two days ago McDonald's Singapore quietly announced that they would introduce a Create Your Taste menu at a single branch here in Singapore. Tonight I finally made my way over to the, horribly located, Jurong East branch to give it a try. 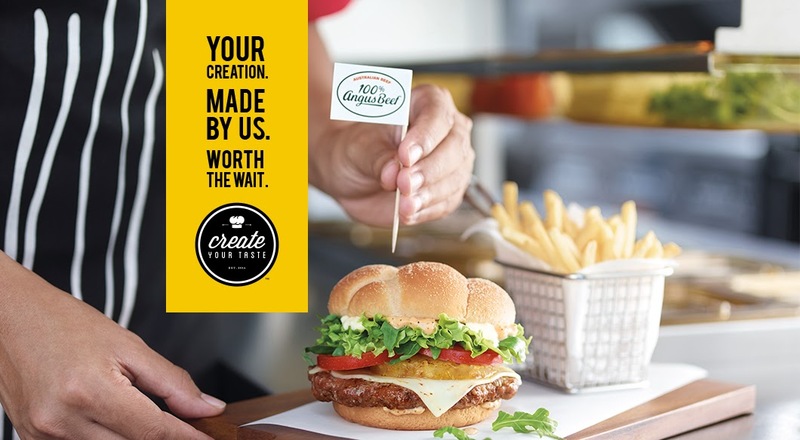 For those of you that are not familiar, the "Create Your Taste" menu is where you can "create" your own gourmet burger with toppings of your choice. 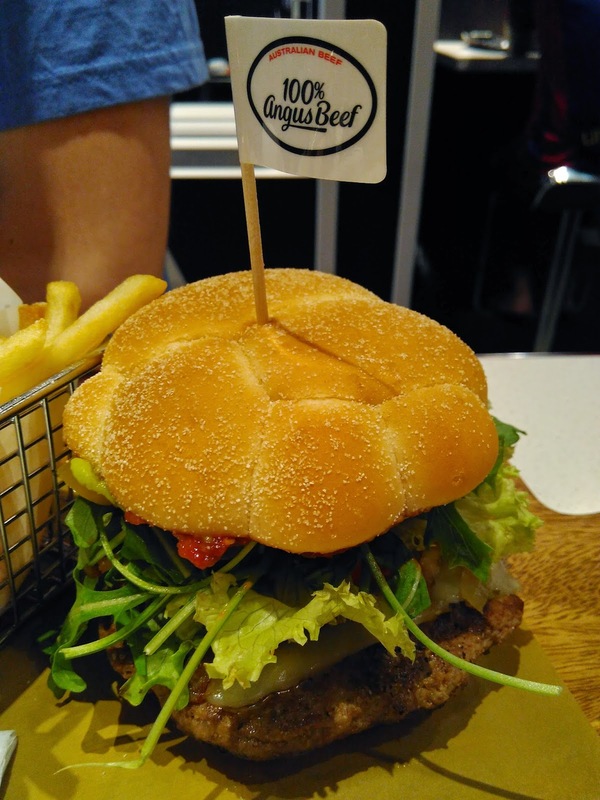 It started at a handful of branches in the US and has since expanded to Australia and New Zealand. 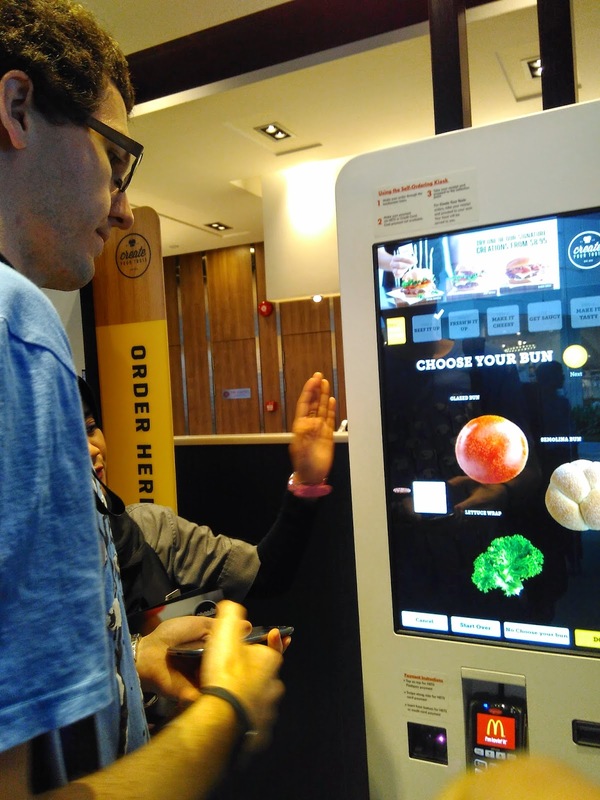 Although spread around, the premise is the same, you 'build' your burger at a kiosk, and after a bit of a wait, it's brought to your table, restaurant style. 1) Bun - Glazed & Semolina traditional buns, or a "bunless" lettuce wrap. 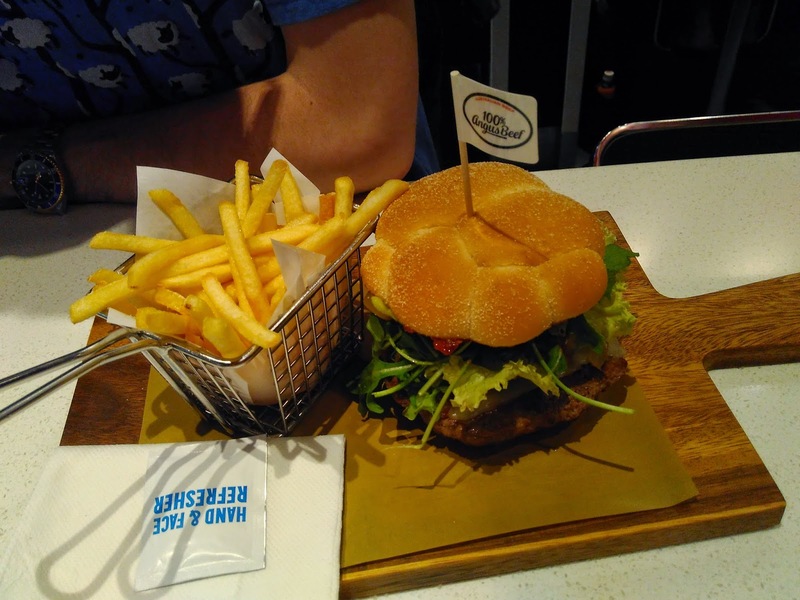 2) Beef - There wasn't any alternative, nor like in Australia was there an option to make it a double, but you still had to pick it. 3) Veg - Caramelised Onions reappears in Singapore after a slight absence. Tomatoes, Whole Leaf Lettuce, Red Onion Rings and also making their first appearance to Singapore, Wild Rocket Leaves & Sliced Jalapeños. The staff that was 'helping' us said we can pick 2-3 veg. The kiosk let us pick everything, so that's exactly what we did. 4) Cheese - Swiss, Classic, Colby or Pepper Jack Cheese. Again, unlike in Australia, it's one or none, no options to try multiple slices. 5) Sauce - Standards like BBQ Sauce, Big Mac Sauce, Ketchup and Mustard, together with completely new sauces, Garlic Aioli, Black Pepper Sauce, "Spicy" Sauce and Tomato Jalapeño Relish. 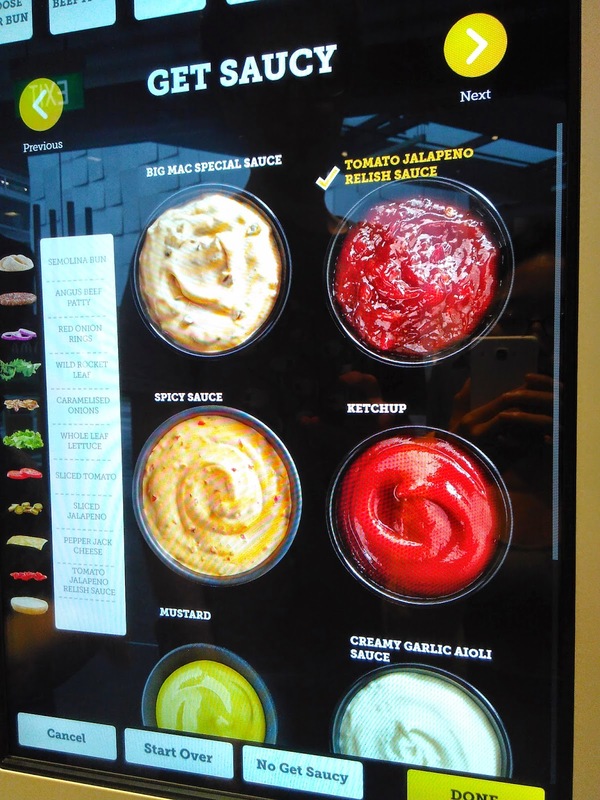 In other countries you can get sauce on the side, but not here. You can add all 8 sauces on your burger if you wanted. No extra charges for additional sauces. 6) Upsell - Tortilla Chips, Grilled Pineapple Ring, Guacamole, Grilled Mushrooms, and regular menu Turkey Bacon. Since these are an extra $0.60-$1 each, they'll happily let you pick them all. I called mine - The Afro™. I chose the Semolina bun, all the veg, pepper jack cheese, and I added Guacamole for an extra $0.60. Although Florida had a Guacamole Burger a couple months ago, I've never been able to try Guacamole at McDonald's before. The Wife™ went with the Glazed bun, all the veg, colby cheese, and both Garlic Aioli and "Spicy" sauce. She didn't add any of the extra toppings, since we've had Turkey Bacon, Pineapple, Nachos (pre-blog in Japan - Miami Burger) on burgers before. She also knows that if she adds Grilled Mushrooms, I won't be able to try the burger since I can't stand mushrooms. 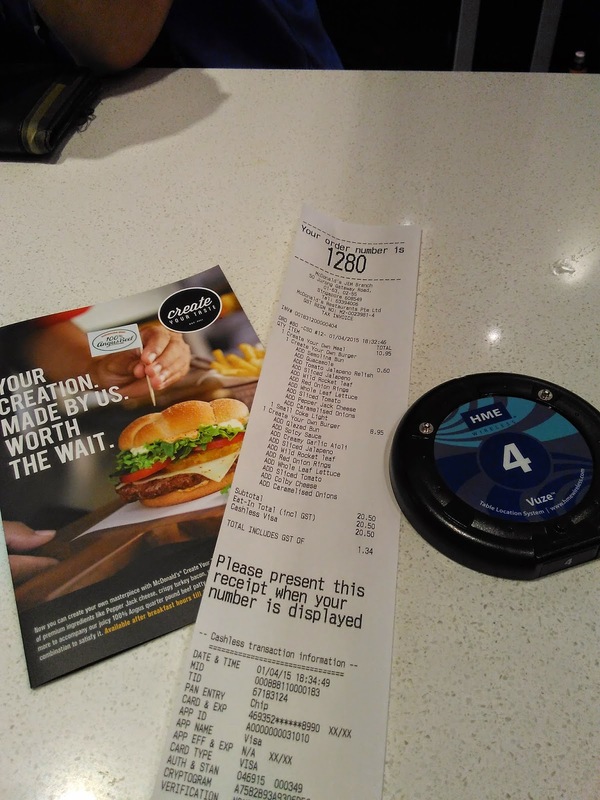 After placing the order you have to take a disk to a table. They are very clear that the disk has to be on the table, but they never explain why. 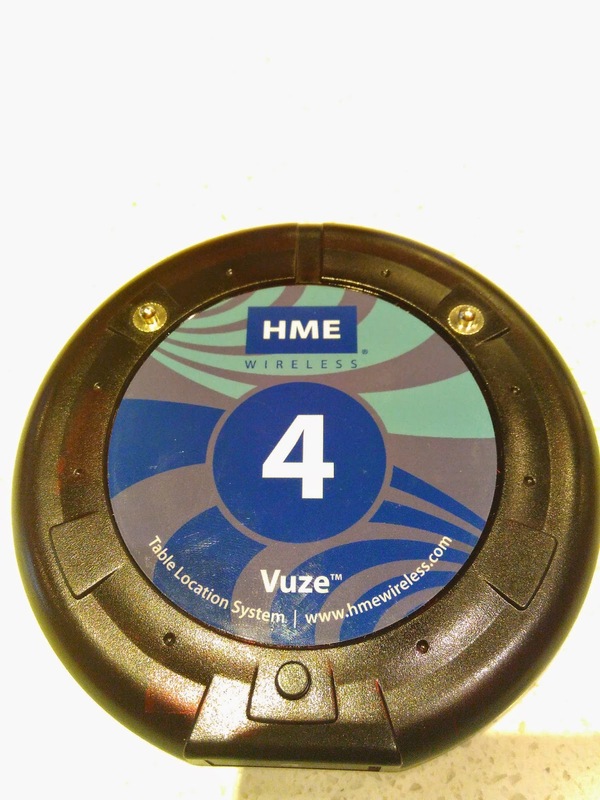 Although you might think this is one of those vibrating restaurant queue disks, these actually communicate with the table and tell the staff exactly which table in the restaurant you are sitting at. It did take about 10 minutes before our order was ready, and they were brought over by two very friendly staff members. 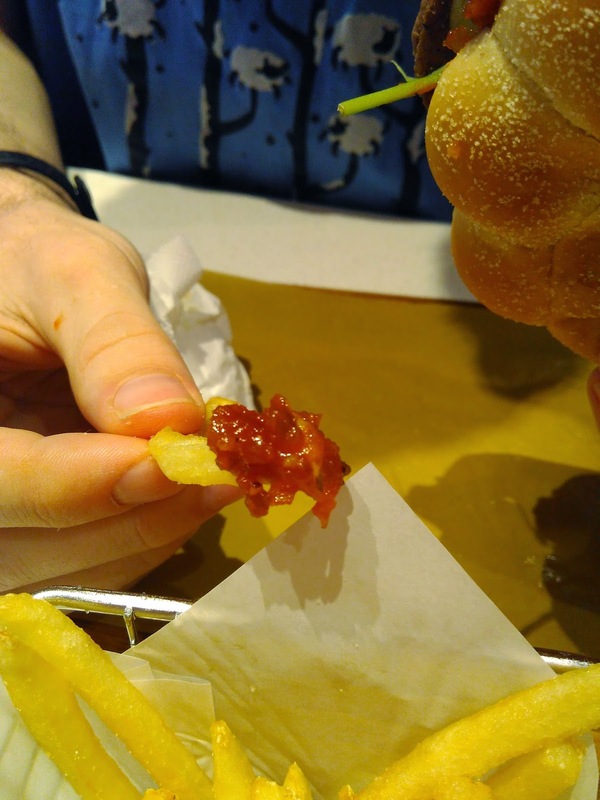 The presentation was great, not only were they served on cutting boards - roadhouse style, but the fries were served in a mini fry basket and a hand wipe. Since there were so many toppings, I'll just talk about the ones that stood out the best. Of the two buns, we both preferred the Glazed bun. It was soft and had a buttery flavour to it, the semolina bun wasn't bad, but it was a bit on the floury-side which distracted from the other flavours. 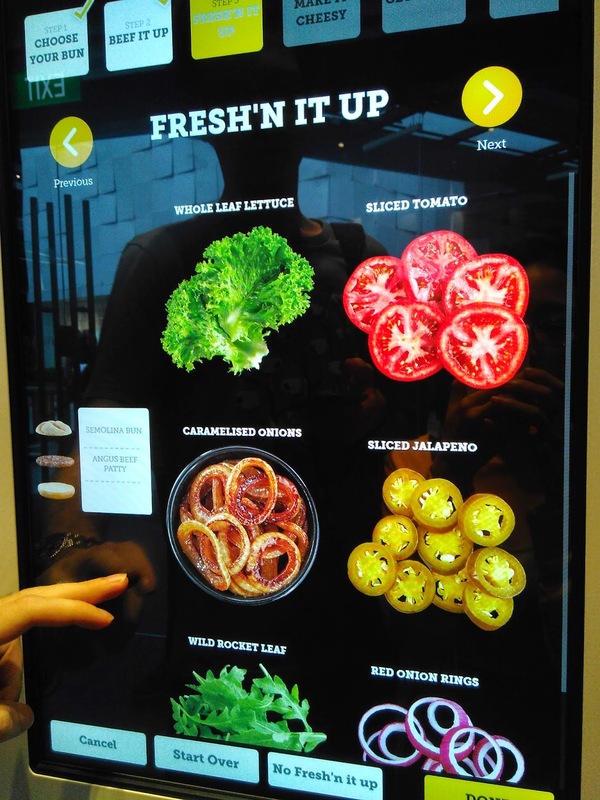 Since both burgers had all the veg options, I was most disappointed by the Rocket Leaves, as they could have had more bitterness to them. I'm still a little perplexed why/how Rocket became an option in the first place. 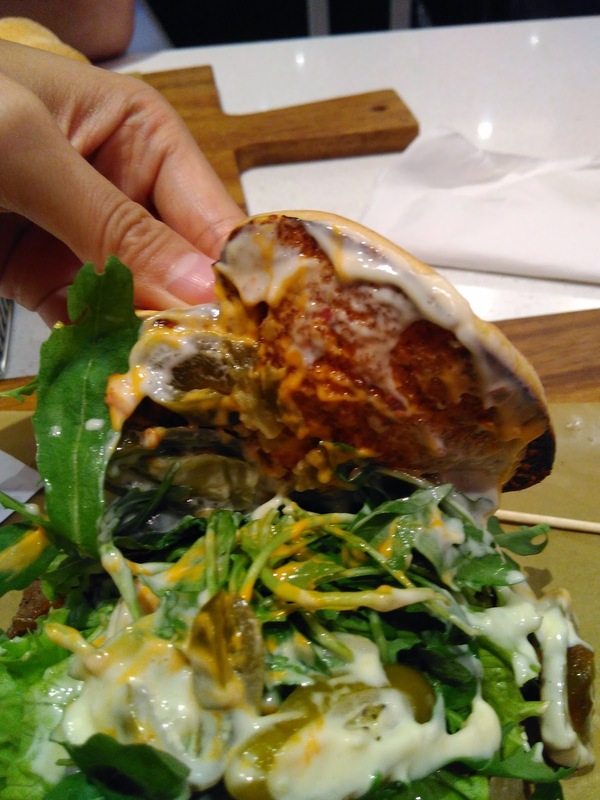 It's not something found in Singapore, it's not 'trendy' and it's not even a traditional burger topping. They weren't available in other Create Your Taste countries, so I really have no idea where this one came from, I do like the attempt though. Although I usually find sliced jalapeños on the salty side, I rather enjoyed these on the burger. Much to my surprise, they even had a decent kick to them! 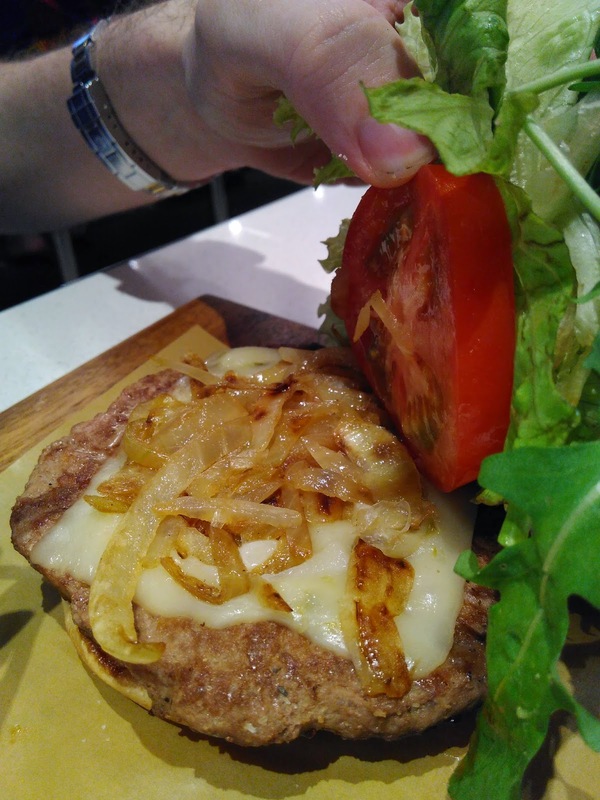 The grilled onions didn't have nearly as much impact as they did with the Twilight burger, and there wasn't really enough of them to add much flavour. Although a few fell out of my burger, and I found them decently cooked. Probably the biggest disappointment from either of the burgers was the add-on Guacamole as I could not taste it whatsoever. They had it mixed together with the tomato jalapeño relish, where they probably should have added it to the opposite bun. If I was ordering again, I wouldn't spend any extra for it. In retrospect, I probably should have tried the nachos on the burger, as the crunch would have been a nice contrast. The nicest surprise on both burgers had to have been the new sauces, and the standout topping was easily the Tomato Jalapeño Relish. Not only was this zesty, but it was properly spicy, although I'm not exactly sure why they called this a relish, it tasted exactly like a salsa to me. When mixed together with the sliced jalapeños it was easily one of the best toppings I've ever had on a McDonald's burger! We also tried the Garlic Aioli and "Spicy" sauce on the other. Both were also very good, the garlic sauce was more garlicky than creamy (just like you'd want - unlike the first time I had Aioli), and the spicy sauce was actually spicy. Although I had initial hesitations about mixing two sauces, I quickly found out that they were a perfect match. Yes - Another awesome shirt. 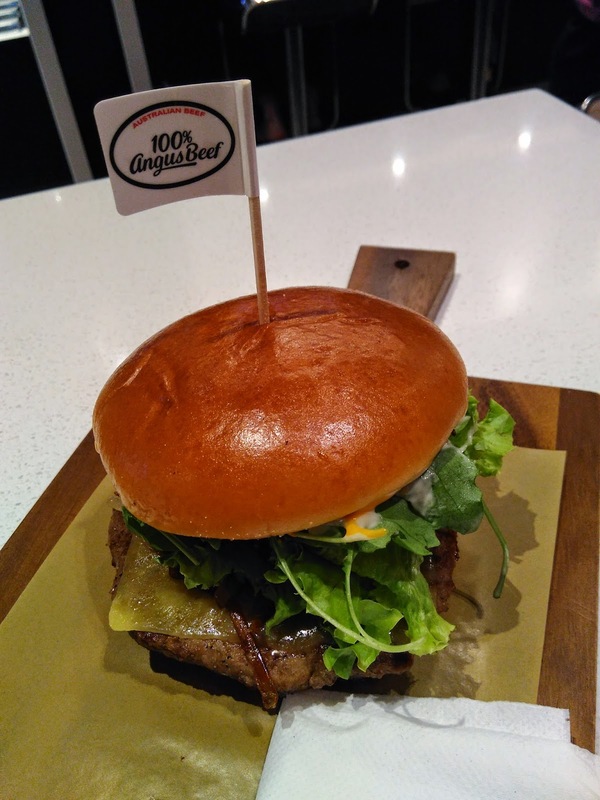 Living in Asia, I'd have to say that these burger looked better than nearly every other alternative in it's price range. 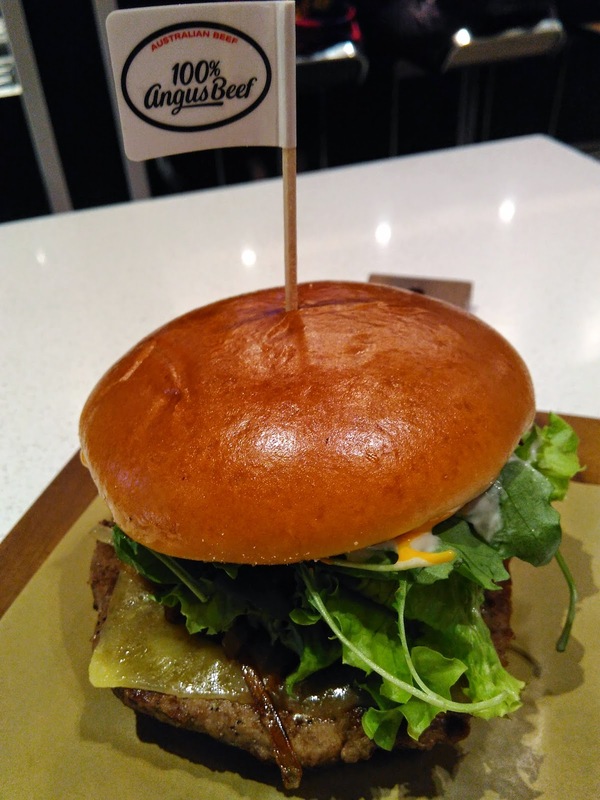 To find a burger of this size and of this quality in Singapore, you'd be looking to spend at least $20+ on it, so the $8.55 burger/$10.55 combo price point is a great value. 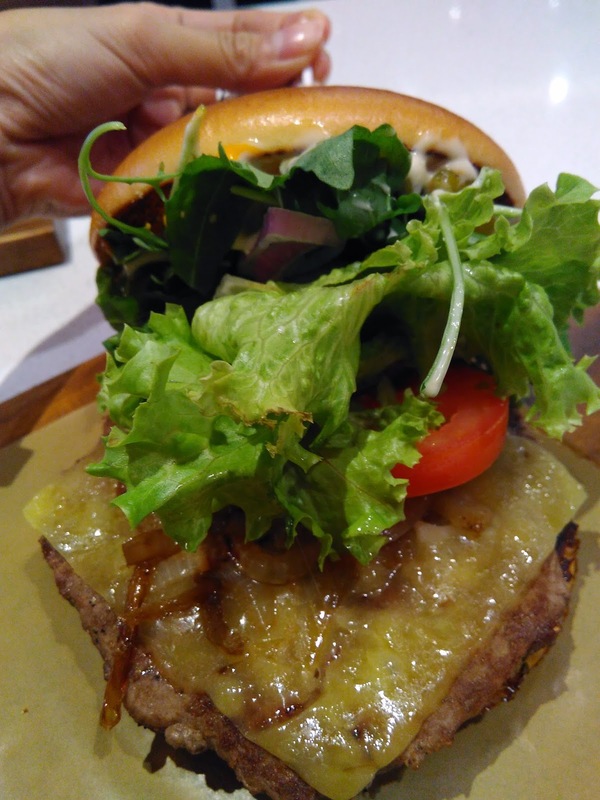 The beef was a 1/3 lbs Angus beef patty, and with the sheer amount of toppings you can add, you'll be able to enjoy it. 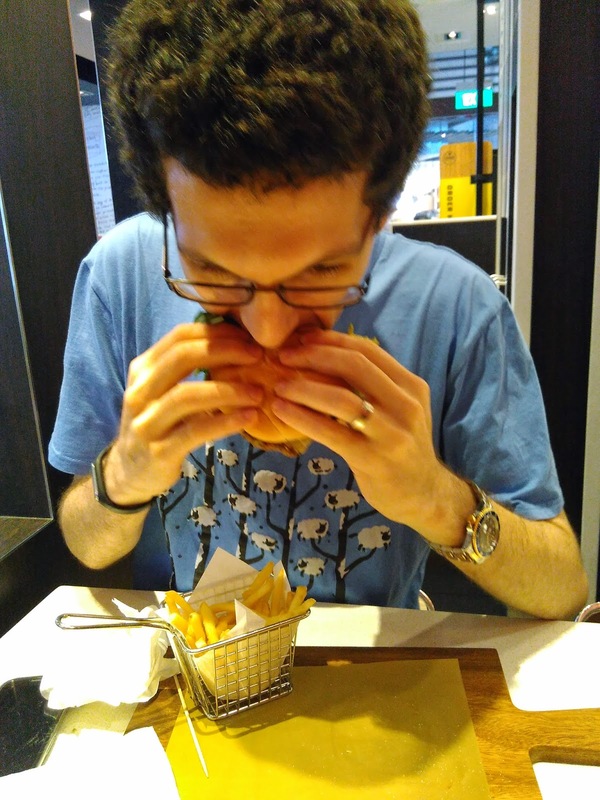 Sure the Singapore options are missing some of the interesting toppings they have in Australia, like beet root, shredded parmesan cheese, multiple fry options, but this was still very enjoyable. If they spread out around Singapore before we leave in August, I'll be sure to have it again. are u leaving sg forever? :( gonna miss your interesting reviews! Yes, we'll be leaving for Bangkok! I'll keep reviewing wherever I go, and I'm sure to be down to SG, for work. 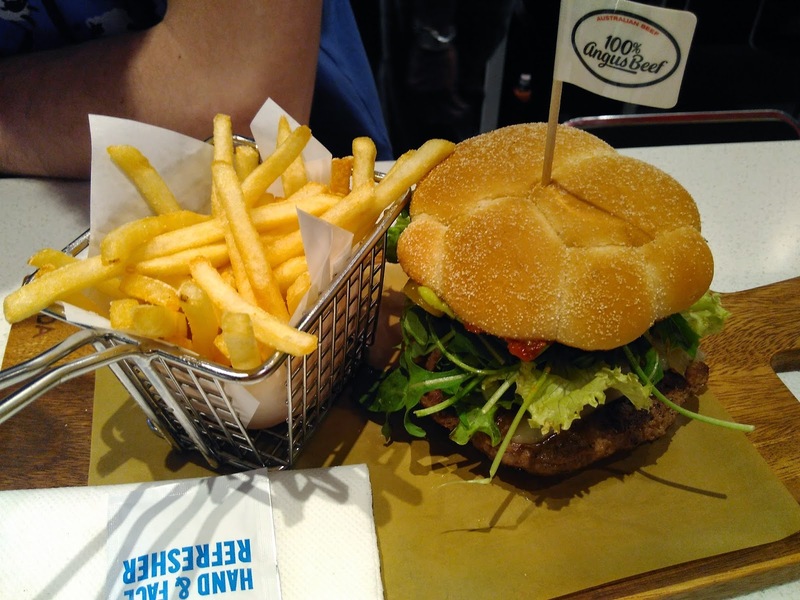 Hello, I dropped by your blog while searching for a burger. I'm also a fellow fan of McDonald's and eat it in every country that I go to. I love your writing, it's very informative (hope this combination of letters doesn't make this comment go to spam) and just to shed a bit of light on the arugula thing, it's coz rocket is very trendy in Singapore and Malaysia. 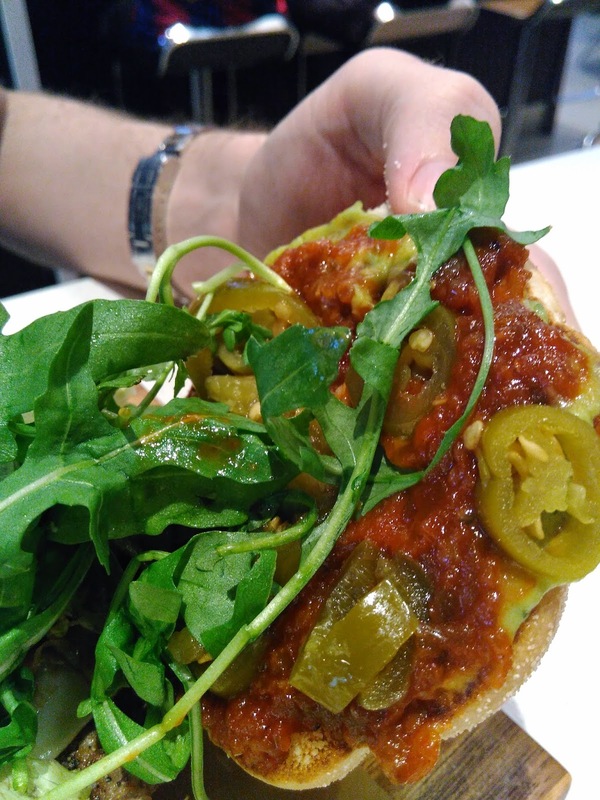 Rocket leaves started to appear on EVERYTHING in 2010 - it was a very trendy ingredient, at least in Malaysia. I know a lot of farmers in Cameron Highlands (an elevated hill that's colder and conducive to growing everything from strawberries to arugula) started to plant to keep up with the demand and it appears in the higher end groceries as "organic" arugula. Then, it went mainstream and people found out they could grow arugula on their balcony/porch/backyard and so they did. That's probably how it ended up in Singapore - having come from a large farm in Cameron Highlands (Singapore imports a lot of food from Malaysia). The trend for arugula has largely run its course and died down but a resurgence seems to be happening. Cheers!